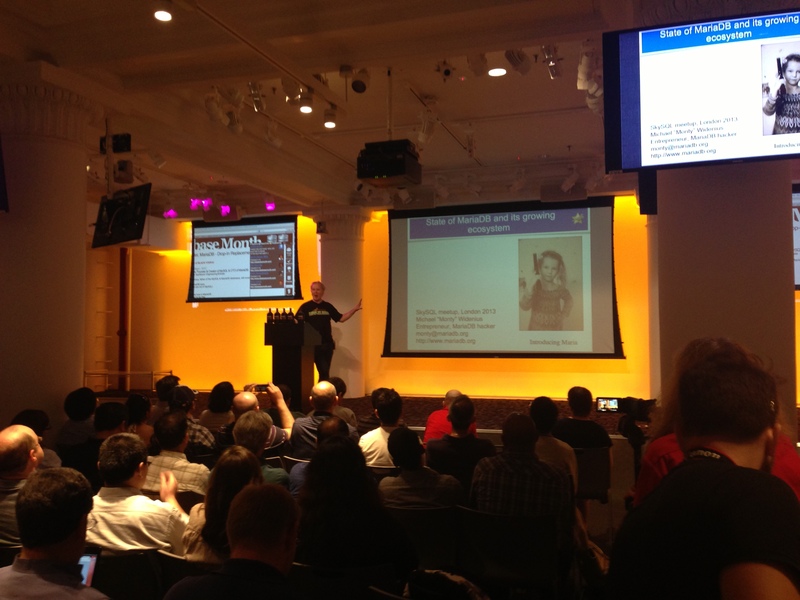 Yesterday evening I had the privilege of hearing tech legend Michael “Monty” Widenius, founder of MySQL, give a presentation on MariaDB at the AppNexus headquarters to an audience of 300+. MySQL is the world’s pre-eminent open source database, and Monty’s contributions still make up 60% of the current source code! Last night I went to a NYC MySQL Group meetup entitled “Future of 21st Century Databases: CEO/CTO Discussion among Database Superstars“. 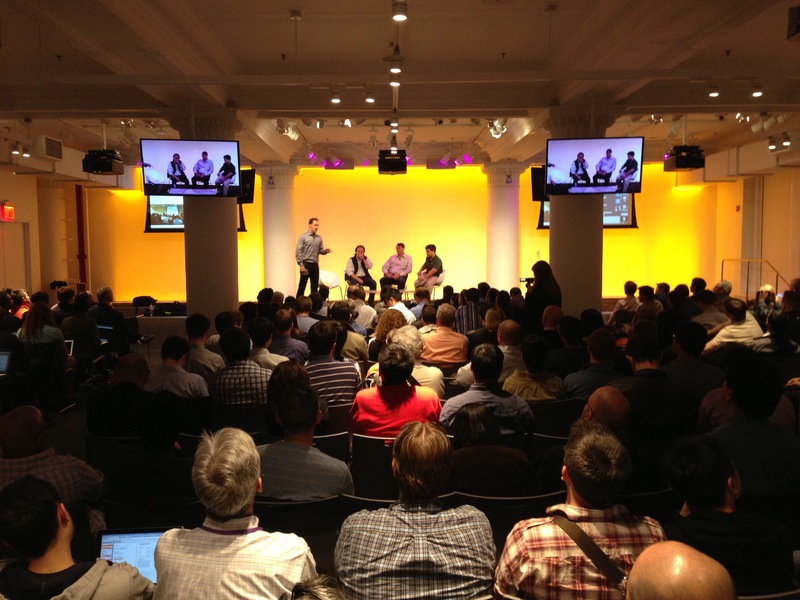 Originally scheduled at AOL‘s offices, it was moved to AppNexus‘ headquarters due to overwhelming demand — it was packed with over 600 attendees (they expected 300). That speaks volumes about the growing interest in NoSQL (Not Only SQL) databases. The guest panel of the evening featured executives from 3 major NoSQL database vendors: Barry Morris of NuoDB, Bob Wiederhold of Couchbase, and Eliot Horowitz of MongoDB. There was little if any debate among them, as the focus seemed to be on the unique features of NoSQL as compared to traditional relational data stores. Last night I attended a great DDD NYC Meetup at the Manhattan headquarters of TheLadders.com. The special guest was Eric Evans, the author of “Domain-Driven Design: Tackling Complexity in Software,” the seminal work on the concept of Domain Driven Design. 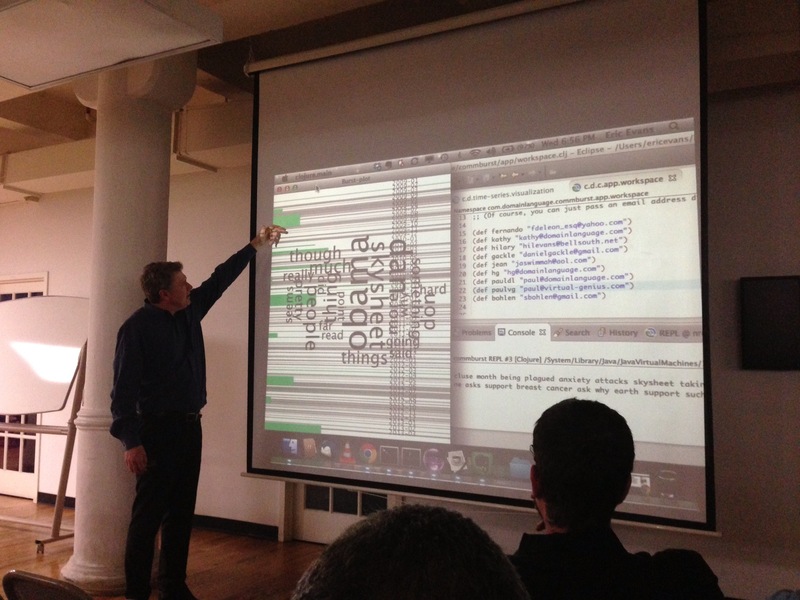 Eric gave an informal walk-through of his latest side project using Clojure, a procedural language for the Java runtime, and MongoDB, an open-source NOSQL database. I was hoping that we would apply DDD analysis to it, which unfortunately he did not. I can imagine that as a DDD consultant the last thing he wants to talk about after hours is DDD. However, the project was really quite interesting. Eric’s idea is an algorithm to mine through years of emails with another individual to discover “bursts” of communication. Then a word cloud can be generated for each burst and presented on a timeline to display what was discussed. According to Eric, the word clouds are eerily accurate about what was discussed (economy, elections, new baby, etc). Finally, Eric is working on an alert engine that will tell him when he is “due” for another burst of communication with an individual; a “reminder” to reach out to a friend that he only writes to a few times a year perhaps. A truly unique concept to help people comb through the deluge of emails for meaningful and actionable information. Thanks to Eric for taking the time to talk to us and TheLadders.com for the location, pizza, and beer!